I been seriously lacking in posting side dishes lately! Side dishes can be one of the best parts of the meal so I’m not sure why I haven’t been better about sharing some of my favorites with you. 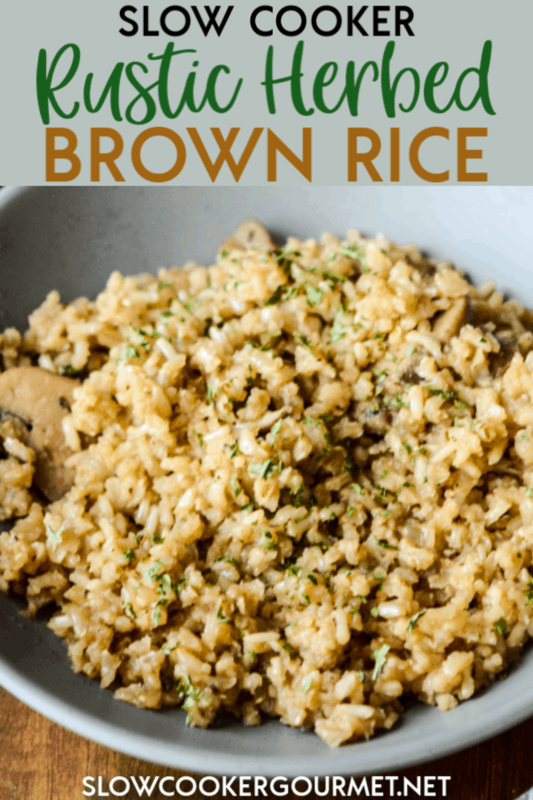 This rice is one of my new favorites and will be on a regular rotation at our house. It’s pretty versatile and will go with so many things plus everyone loved it! 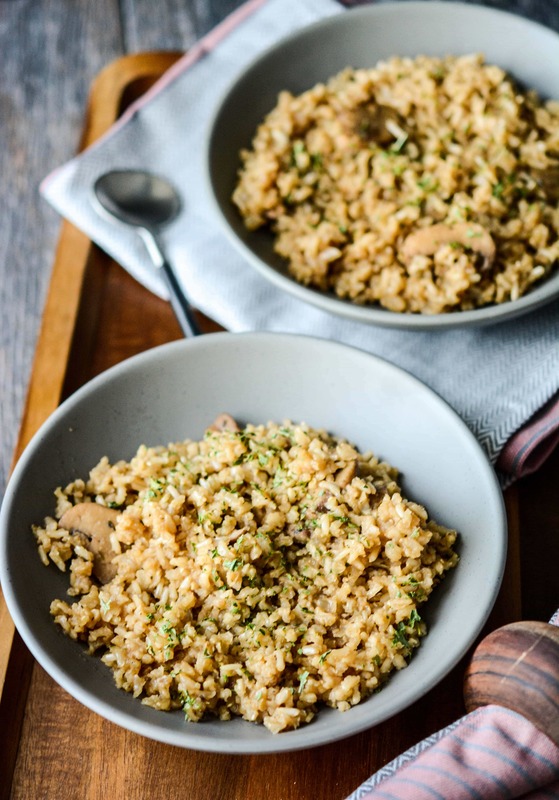 Can’t go wrong with a recipe that like, especially when it’s easy to make in the slow cooker! I kept it pretty simple and stuck to the basics here to make a rustic inspired side dish. The beauty is that with this simple recipe you can add to it in so many ways to make it your own. Change out the herbs, add veggies or even throw in some cheese. It’s all you! 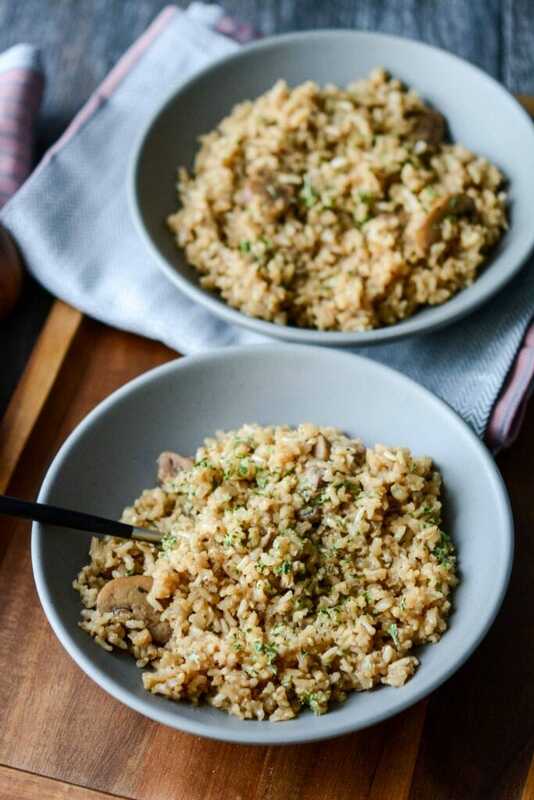 Now to be fully honest, I will usually use my rice cooker to make all my rice side dishes and I love it! But they can be kind of pricey (got mine as a gift) and kind of bulky to store and not everyone wants or needs one so I decided to experiment with the slow cooker method. 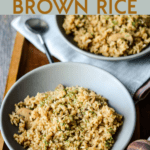 I was very happily surprised at the results and figured out a few tips that will make your rice turn out even better so check those out in the recipe below!! I cooked this from start to finish in my 4 quart multi cooker for 2.5 hours on high. 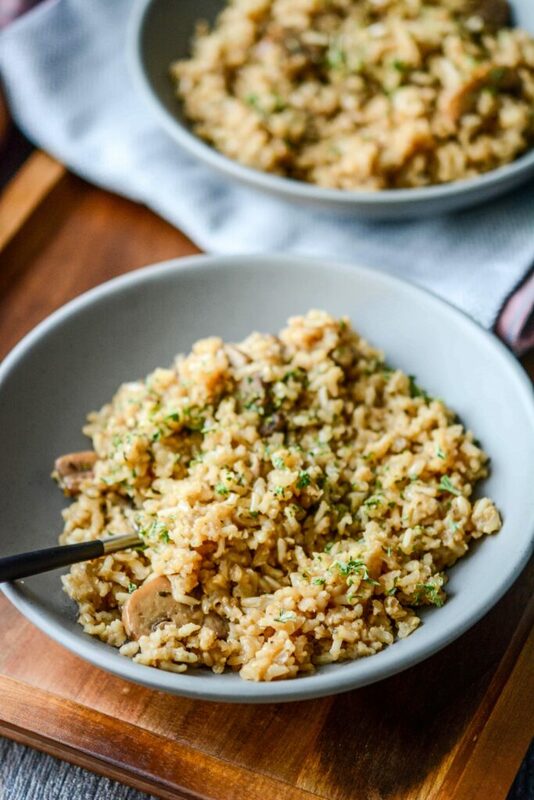 Sautéing the rice before slow cooking will help it maintain the best texture. Feel free to switch out for your favorite herbs or to add additional chopped veggies or shredded cheese (stir in cheese after cooking). Waiting until fully cooked and then tasting this recipe to add salt is preferred because the beef broth can be pretty salty and it's better to add more later than to have added too much early on. Hi Lora, I recommend it on high, cooking it on low will probably make it too mushy. Do you think I could add beans to this recipe? If yes what kind would you recommend? My options are limited. I have on hand black beans, red beans, or navy beans! Yes! I think any of those would be perfect, I think my personal pick would be black beans. Then it will be like a whole meal!! Maybe even top with some fresh sliced grape tomatoes. I tried your recipe last night. turned out really good but took quite a bit longer to cook than your indicated time. It was more like 4-4.5 hours. I had my (new) crock pot on high so I don’t know if perhaps yours is more powerful than mine if that’s even possible. Do different slow cookers vary in how powerful they are? Anyway, Just thought it might be useful for some to know that it can take up to 4-5 hours to make this. totally worth it though. They can vary in temp, so I appreciate your feedback! I will add a note to the recipe about cooking times. I’m glad you were able to get it figured out!! Cooked exactly towards directions, after 2 hours was mushy but still not cooked through. Added more broth and cooked another 30 min really mushy. Idk smells great but something off here. 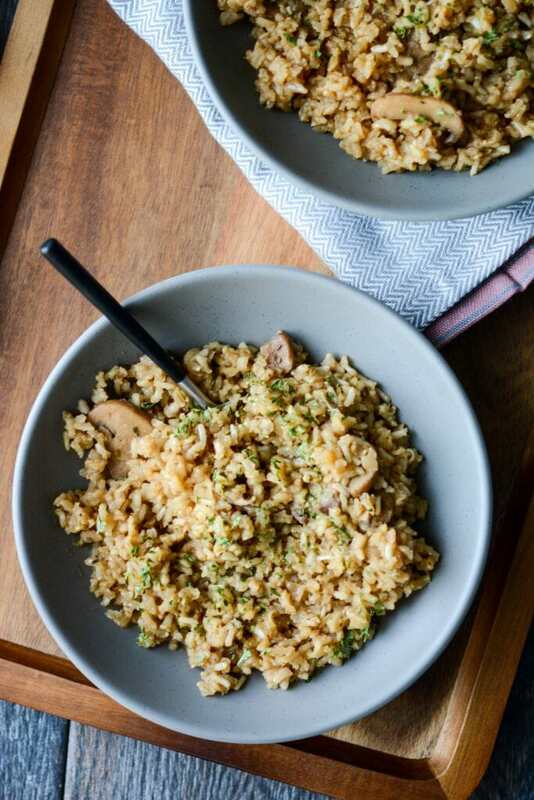 Do you add uncooked rice to the skillet and sauté? Hi Emma! Yes, it helps to toast up the rice before transferring it to cook. If i need more servings, could I double or triple the recipe or will the ratio of water and spices change? Hi Maria! You should be able to triple everything for this recipe. You will probably need a larger slow cooker. Let me know how it turns out! Could you use the low heat for 5-6 hours or would the texture be off? Maybe. I think since it would be sitting in the liquid longer it would become a little mushy. 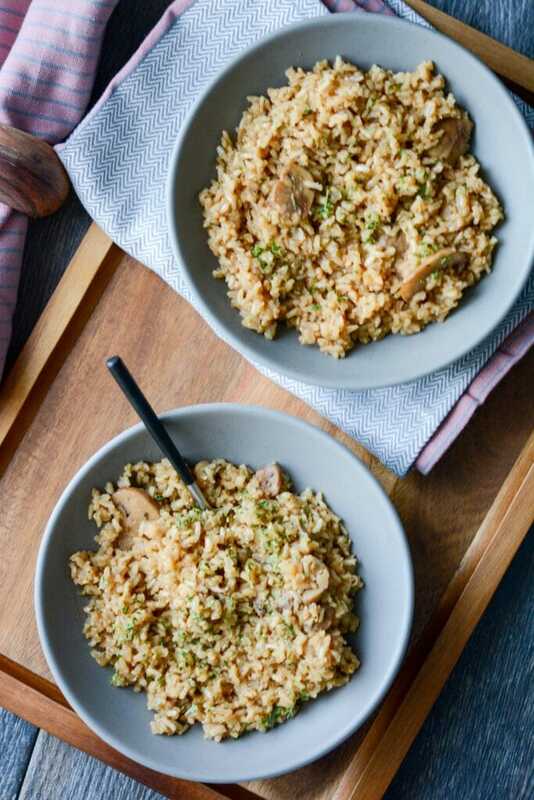 Since the rice cooks so much faster I’d probably say just sauté up the chicken (maybe in a little butter or olive oil?) 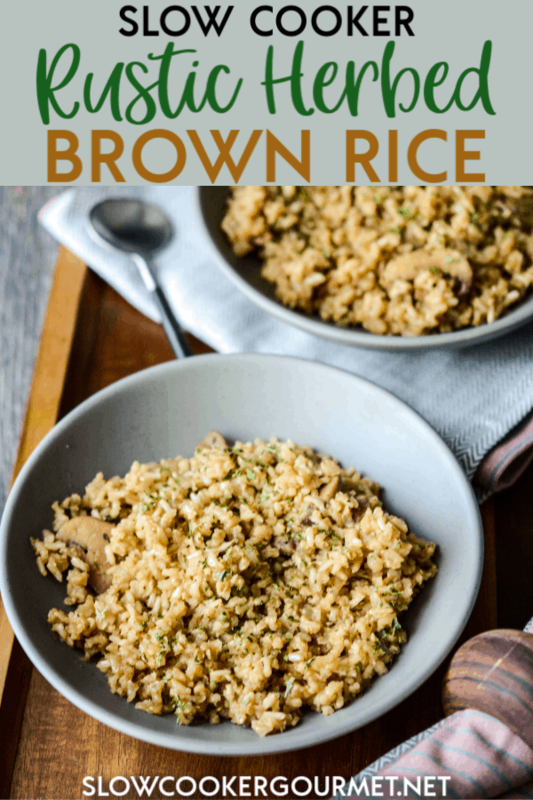 so that it’s browned and mostly cooked and then add it when you start the rice and it will finish cooking while the rice cooks! I think it would be delicious! 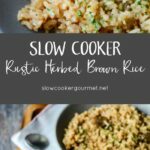 I have never tried rice in the slow cooker before. I’ll have to give this a try. I love all of the fall flavors in here!